Western National Insurance Group today announced that it has been named a recipient of the 2009 Alfred P. Sloan Award for Business Excellence in Workplace Flexibility. This prestigious national award honors organizations across the country that are successfully using workplace flexibility as a strategy to increase workplace effectiveness and yield positive business results. "Finding ways to properly balance the needs of our customers with those of our employees and their families is an ongoing goal of our company," said president and chief executive officer, Stuart C. Henderson, JD, CPCU. "Being recognized in this area while at the same time maintaining a high customer retention shows that we are succeeding in that balancing act." 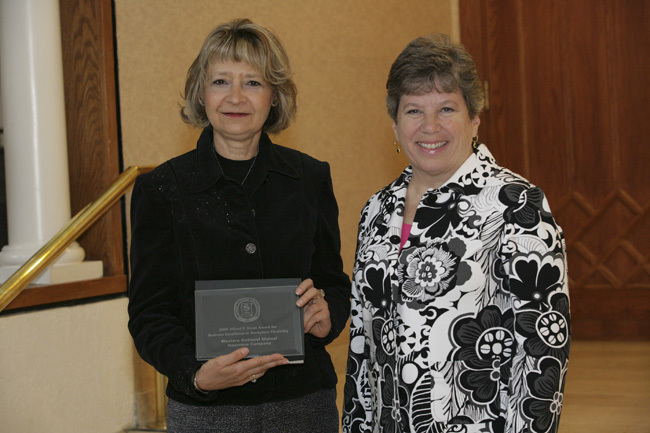 Western National was one of 19 Twin Cities-area organizations to receive the award. Other local recipients were: Accenture, Best Buy, Deloitte LLP, Dorsey & Whitney LLP, Ernst & Young, fahrenHEIGHT360, General Mills, Health Service Innovations, KPMG LLP, Lutheran Social Service of Minnesota, Mahoney, Ulbrich, Christiansen & Russ PA, Minnesota Child Care Resource & Referral Network, MRM Worldwide Minneapolis, Netgain, Prevent Child Abuse Minnesota, RSM McGladrey, Inc., Synergystic Software Solutions, and U.S. Bank. The Alfred P. Sloan Awards are part of the When Work Works project,an ongoing initiative of the Families and Work Institute, the Institute for a Competitive Workforce (an affiliate of the U.S. Chamber of Commerce), and the Twiga Foundation. Through When Work Works, these partner organizations provide research, resources, and recognition to employers nationwide. The project shares the results of research on creating effective and flexible workplaces that meet the needs of the 21st century. Each of the 2009 Sloan Award winners will be featured in next year’s edition of the Guide to Bold Ideas for Making Work Work, published by the Families and Work Institute. “From new forms of flexible work arrangements that minimize lay-offs, to creative cost-cutting that retains core medical benefits, to providing financial information and support to employees, these employers are braving the economic storm through innovative policies that prevent undue shock to their workplaces and their employees,” said Ellen Galinksy, president of the Families and Work Institute, in a press release. Western National Insurance Group, headquartered in Edina, Minn., is a super-regional property-and-casualty insurance group writing over $245 million in Direct Premium in nine states. The group consists of three active companies (Western National Mutual Insurance Company, Western National Assurance Company, and Pioneer Specialty Insurance Company) serving personal and commercial customers in Minnesota, Nevada, Oregon, South Dakota, Utah, Washington, and Wisconsin, as well as commercial customers in Iowa and North Dakota. All of the group’s products are sold exclusively through professional independent agents.